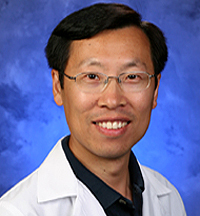 Dr. David Liu is an Associate Professor at the Washington State University College of Pharmacy, Spokane, Washington, U.S.A. He received his Ph.D. in molecular genetics in the City University of New York, New York, in 1997, and had his postdoctoral training in the areas of mammalian cell cycle regulation and proteosome-dependent protein degradation regulation in Dr. Michele Pagano’s laboratory at New York University, New York, New York, from 1997-1998 and of neuronal differentiation and survival regulation in Dr. Lloyd Greene’s laboratory at Columbia University, New York, New York, from 1998-2002. Before joining the WSU, he was anAssistant Professor at the Penn State College of Medicine, Pennsylvania, U.S.A., from 2006-2002, andaResearch Associate at Columbia University, New York, New York, from 2002-2006. 1. Yuan Y, Liu D, Lengel K, Min He, Yidi Xu and Liu DX* ATF5 anchors pericentrin to the proximal end of the mother centriole to promote PCM formation (in revision). 2. Zhang HQ, Qian D, Hu M, Wang B, and Liu DX* Activation of Bcl-2 and suppression of Bax by ATF5 promotes paclitaxel resistance in ovarian cancer cells. (submitted). 4. Hu M, Wang B*, Qian D, Li L, Zhang L, Song X, and Liu DX* (2012). Interference with ATF5 function enhances the sensitivity of human pancreatic cancer cells to paclitaxel-induced apoptosis. Anticancer Res. 32(10):4385-94. 5. Lengel KL and Liu DX* (2012). Cell type-dependent function of ATF5: Where we go from here. Cell and Development Biol. 1:e114. doi:10.4172/2168-9296.1000e114. 6. Zhang Y, Cheng Y, Ren X, Horis T, Huber-Keener KJ, Zhang L, Yap KL, Liu DX, Shantz L, Qin Z, Zhang S, Wang J, Wang HG, Shih IM, and Yang JM (2012). Dysfunction of Nucleus Accumbens-1 Activates Cellular Senescence and Inhibits Tumor Cell Proliferation and Oncogenesis. Cancer Res. 72(16):4262-75. PMID: 22665267. 7. Chen A, Qian D, Wang B, Hu M, Lu J, Qi Y, and Liu DX (2012). ATF5 is overexpressed in epithelial ovarian carcinomas and interference with its function increases apoptosis through the downregulation of Bcl-2 in SKOV-3 cells. Intl. J. Gynecological Path. 31(6):532-7. PMID: 23018213. 8. Liu X, Liu D, Qian D, Dai J, Jiang S, Stanley B, An Y, Yang J, Wang B, Liu X and Liu DX* (2012). Nucleophosmin (NPM1/B23) interacts with ATF5 and promotes proteasome- and caspase-dependent ATF5 degradation in hepatocellular carcinoma cells. J. Biol. Chem. 287(23):19599-609. PMID: 22528486. 9. Liu DX*, Qian D, Wang B, Yang JM, and Lu Z (2011). p300-dependent ATF5 acetylation is essential for Egr-1 gene activation and cell proliferation and survival. Mol. Cell. Biol., 31(18):3906-3916. PMID: 21791614. 10. Dluzen D, Li G, Tacelosky D, Moreau M, and Liu DX* (2011). Bcl-2 is a downstream target of ATF5 that mediates the pro-survival function in a cell type-dependent manner. J. Biol. Chem. 286(9):7705-13. PMID: 21212266. 11. Zhang Y, Cheng Y, Ren X, Zhang L, Yap KL, Wu H, Patel R, Liu DX, Qin ZH, Shih IM and Yang JM (2011). NAC1 modulates sensitivity of ovarian cancer cells to cisplatin via altering the HMGB1-mediated autophagic response. Oncogene. in press. doi:10.1038/onc.2011.290. PMID: 21743489. 12. Li G, Xu Y, Guan D, Liu, Z and Liu DX* (2011). HSP70 promotes survival of C6 and U87 glioma cells by inhibition of ATF5 degradation. J. Biol. Chem. 286(23):20251-9. PMID: 21521685. 13. Zheng Y, Yang W, Xia Y, Hawke D, Liu DX and Lu, Z (2011). Ras-induced and ERK1/2 phosphorylation-dependent isomerization of PTP-PEST by PIN1 promotes FAK dephosphorylation by PTP-PEST. Mol. Cell. Biol., 31(21):4258-4269. PMID: 21876001. 14. Liu X, Yang JM, Zhang SS, Liu XY, and Liu DX* (2010). Induction of cell cycle arrest at G1 and S phases and cAMP-dependent differentiation in C6 glioma by low concentration of cycloheximide. BMC Cancer 10:684-694. 15. Samarrai W, Liu DX, White AM, Studamire B, Edelstein J, Srivastava A, Widom RL, and Rudner R (2010). Differential response of Bacillus subtilis ribosomal 1 RNA promoters to nutritional stress. J. Bact. 193(3): 723-33. 16. Hu M, Qian D, Hou Y, Peng K, Li L, Song X, Liu DX, and Wang B (2010). Expression of ATF5 and Bax in the apoptosis of pancreatic cancer cells SW1990 induced by paclitaxel. J. Med. Postgrad. (China), 23(11):1127-31. 17. Wu H, Zhu H, Liu DX, Niu TG, Ren X, Patel R, Hait, WN, and Yang JM (2009). Silencing of elongation factor-2 kinase potentiates the effect of 2-deoxy-D-glucose against human glioma cells through blunting of autophagy. Cancer Research 69(6):2453-60. 18. Li G, Li W, Angelastro JM, Greene LA, and Liu DX* (2009). Identification of a novel DNA binding site and a transcription target for ATF5 in C6 glioma and MCF-7 breast cancer cells. Molecular Cancer Research 7(6):933-43. 19. Greene LA, Liu DX, Troy CM, and Biswas SC (2007). Cell Cycle Molecules Define A Pathway Required For Neuron Death In Development And Disease. Biochimica et Biophysica Acta 1772:392-401. 20. Biswas SC, Liu DX, and Greene LA (2005). Bim is a direct target of a neuronal E2F-dependent apoptotic Pathway. J. Neurosci., 25(37):8349-58.
. 22. Greene LA, Biswas SC, and Liu DX (2004). Cell cycle molecules and vertebrate neuron death: E2F at the hub. Cell Death Differ. 11(1):49-60. 23. Liu DX*, Biswas SC, and Greene LA (2004). B-myb and C-myb play required roles in neuronal apoptosis evoked by NGF deprivation and DNA damage. J. Neurosci. 24(40):8720-5. 24. Angelastro JM, Moon NY, Liu DX, Yang AS, Greene LA, Franke TF (2001). Characterization of a novel isoform of caspase-9 that inhibits apoptosis. J. Biol. Chem. 276(15):12190-200. 25. Liu DX* and Greene LA (2001). Neuronal apoptosis at the G1/S cell cycle checkpoint. Cell Tissue Res. 305(2):217-28.